I worked at Timpson from 1980 to 1986 after leaving Dolcis. I started as a Trainee Assistant Stock Controller and ended up as a Buyer/Merchandiser. After Timpson I went down to London to work at Top Shop/Top Man before skipping back up North to Barratts in 1988. Driving past the old Timpson House building at the weekend I saw it had been demolished! Looking all over Google I couldn’t find a photo of it – which is bizarre since it was such a prominent building, having been there since the sixties. I’m pretty sure that it was never fully rented since Timpson left it! In later years, and I’m not sure when the warehouse which was across the yard from the offices was knocked down and Tesco as built on the site plus the old car park at the rear. I’ll never forget parking at the back and then when I got my first company car, getting a space a little bit nearer! I never got to park at the front, that was reserved for senior staff and directors but I remember the layout perfectly. 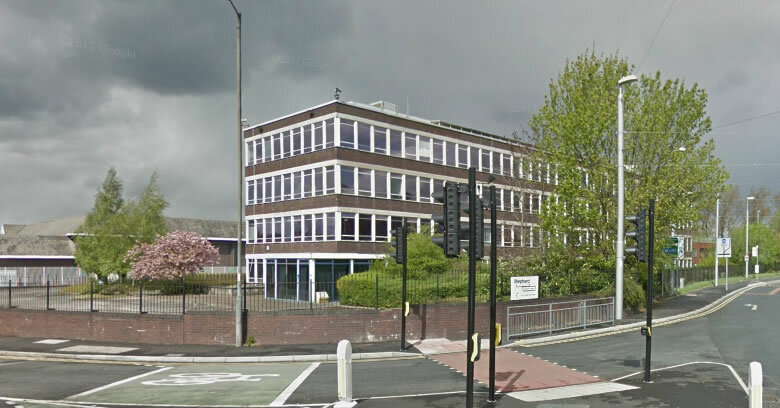 This is a picture of Timpson House before it was pulled down. I’ll flesh this page out a little as I remember more about my life there. I actually have a staff magazine somewhere. I passed my Business Studies degree whilst working there and they paid for me to do it at Manchester Poly – which is now Manchester Metropolitan University. This was my introduction into life as a shoe buyer, a job that I progressed at Barratts from 1988 to 1996, after which I left to set up my own supply company. 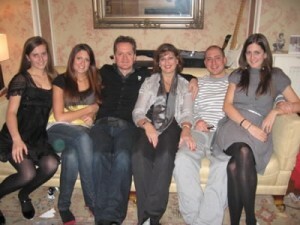 Above anything else I am a family man with four fantastic kids and an amazing wife! we have been together since I was 13, so she know more about me than most! I have been interested in Shoes all my life and apart from the fact, can’t really explain why! At 12 years old I was sporting a pair of black suede ‘Brothel Creepers’ and no this wasn’t 1955! I must have just been born with the interest. My first job was at Dolcis Shoes as a Trainee Manager! I worked in the Market Street branch in Manchester under a guy called ‘Mr’ Murphy – it was all very formal in those days and suits and ties were the order of the day. Having decided that running a shoe shop wasn’t for me (lol!) I moved on to Timpson Shoes where I trained in the buying department for nearly six years. I picked up a degree in Business along the way, studying at night school and weekends at Manchester Polytechnic, (Now Manchester Metropolitan University). Although the family finally moved down to Bushy where we lived we hated the London life, it just wasn’t me!, cue my last ‘real’ job at Barratts Shoes in Bradford. I spent nearly nine years with Barratts! starting as Sports and Slippers Buyer and ending as Men’s and Kids Buying Controller. I totally loved buying shoes, this was what I was meant to do and for me its was the best job in the world. I travelled the world too, one time actually travelling on a round the world ticket from Manchester to The Far East via New York, Miami and Columbia in South America. We went where the shoe factories were, and that was always changing. One year it would be Thailand and Indonesia, the next Vietnam and India. All good things come to an end and although I did enjoy it, it was tough on the kids as I was away a lot, not to mention having to drive from Altrincham to Bradford every day. One day I walking in to Michael Ziff’s (The owner), office and quit. I teamed up with a guy in Portugal and started designing and distributing shoes from a factory there. I called the buisness Network CFD (Commercial Footwear Designs). I moved on to Italy and started devloping shoes for Ben Sherman, Barratts, Priciples, Littlewoods and quite a few others. Europe became difficult in the late 90’s and in 2000 I set up TMC Footwear Ltd in partnership with a large Taiwanese Company. With this company we hit our stride, developing and supplying for Tesco, New Look, Next and many other high street names. In 2004 we sold over 2.3 million pairs of shoes and business was booming. I was running Shoes.co.uk as an Affiliate Website, basically it was a window to other sites selling shoes. For everyone that left shoes.co.uk and bought a pair of shoes from say, River Island or ASOS, Shoes.co.uk would receive some commission. It was great and because we didn’t need the money to live on so it just accumulated. By 2006 we had enough money in the bank to turn Shoes.co.uk in to a proper shop and that’s exactly what I did! Of course I knew many of the suppliers from my buying days. I took on the Ex-Buying Director from Schuh and erstwhile Littlewoods Buyer Jackie Hodge and we went about formulating the plans to open the British Zappos, Shoes.co.uk was born! I had a buyer, a Web Developer and Designer and went about buying shoes for the new venture. We finally closed the company in March 2016 and sold the assets to Shoon Ltd who will opearte the website from July 2016.